In today’s world, we come to rely on our appliances to run smoothly and efficiently. When it comes to problems with your refrigeration system, it is always important to hire a qualified refrigeration technician to make sure your refrigeration repairs are done right. Boyle Heating & Cooling is Peterborough’s expert at refrigeration repairs, having been working in this area since 1997 when it was one of the major focal points of the company. 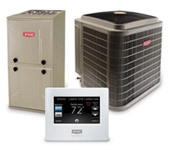 Boyle has since expanded their services to include home heating and cooling options, but refrigeration work, especially commercial refrigeration repair and maintenance, is still an important offering and what has helped us build our excellent reputation.